2 hours, 51 minutes left! Where do I use my Wiggle voucher code? Select a Wiggle code and copy it. Follow the link to Wiggle’s website. Browse for your items and click ‘Add to basket’ when you find the ones you want. Once you’re finished click ‘Checkout now’. Sign in or create a wiggle account. Next, choose your delivery option. On the payment page, you will be able to paste your voucher code into the ‘Add a gift voucher’ box. Click ‘apply’ and your discounts will be added to your order summary along with any other offers that are applicable on your items. 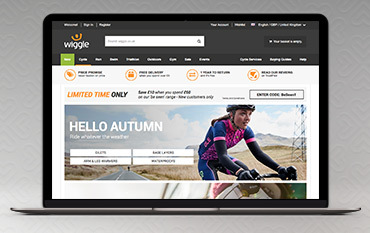 Wiggle is the ultimate online shop for adventure seekers who love being active and exploring. Discover apparel, equipment, nutrition and more and kit yourself out with a great supply of products for hiking, swimming, running and cycling. The range of equipment, accessories and gear on offer at wiggle is unbeatable. Whether you’re an amateur or a pro-you can find the best range of supplies to enhance your performance. For keen cyclists there’s a huge array of bikes available for all kinds of environments, there’s also tons of stuff for triathletes including tri shorts, wetsuits, paddles, helmets and swimming fins. If running is your sport you can discover a variety of helpful things for both leisurely joggers and marathon goers. Find specially designed running shoes, insoles, bottles, base layers, watches and bags, all of which will aid you in your performance and recovery on and off the road. If you’re after outdoor equipment instead of sports gear you can find all you need at Wiggle too. Discover outdoor jackets, thermals, camping and touring essentials, casual clothing, outdoor equipment like torches, cameras and rain covers, as well as fleeces, footwear and legwear from huge brands like Berghaus, Jack Wolfskin, The North Face, Mountain Hardwear and Salomon. If you need help with your buying you can always use the Wiggle buying guides or cycle services to ensure you’re investing in the right things. And if you want to grab a bargain there’s always the sale section and discounts and deals here at NetVoucherCodes. The Wiggle sale section is a great place to grab instant savings on your active wear and equipment. If you want to be kitted out with the best-branded gear, but aren’t too keen on the price tags then browse through the discounted items at Wiggle and fill your sporting wardrobe up for less. Another great way to save money is by signing up to the newsletter where you will find the latest offers and exclusives. These great deals will be regularly delivered straight to your inbox so that you can have a first look of what’s to come. If you're looking for the best range of bikes, that offer both high quality and exceptional value for money then check out Wiggle’s impressive cycle section. Here you’ll find bikes to suit all types of riders with everything from children’s bikes to professional cycling road bikes available. Discover road bikes, single speed bikes, hardtail mountain bikes, full suspension mountain bikes, commuter and urban bikes, cyclocross bikes, kids bikes and frames. If you aren’t sure what to buy you can take a look at the handy cycle buying guides to find all the information you need, as well as the cycle services section, to ensure you’re clued up on everything to do with cycling. Whether you’re a professional cyclist or an amateur cycling enthusiast, you can find all the cycling gear you could need at Wiggle. With a huge array of bikes, clothing, nutrition, accessories, wheels, shoes and components available, you can ensure you’re fully kitted out each time you hop on the bike. Enhance your performance and comfort with the proper bike, shorts, gloves and seat. Make sure you’re always safe with the right helmet and reflective's and make it easier to track your cycling progress and enjoy your bike rides with GPS’, watches and arm & leg warmers, in fact, every type of cycling accessory imaginable at Wiggle. As well as an impressive variety of sports and outdoor wear, Wiggle also has a great gym & fitness section where you can find loads of helpful fitness products for inside and out of the gym. Discover clothing and footwear such as leggings, sports bras, compression wear, trainers and weightlifting shoes as well as recovery and nutrition products, accessories and equipment. With all the gym and fitness items available at Wiggle, you can make sure you’re fully kitted out for your workouts, both in the gym and at home. Wiggle customers have 365 days from the date of delivery to return orders if unwanted. Find more information on how to make a return here. If you have a question or query visit the FAQ page on the Wiggle website. Browse the Wiggle buyers guides. Wiggle sells a huge range of swimming, cycling and running kit. With one of our Wiggle Promotional Vouchers you can make great savings on accessories, bikes, clothing, nutrition, shoes and much more. Wiggle has it all for the most serious of a sportsman, so whether you're doing a triathlon or looking for a top of the range road bike you’ll find all this and more at wiggle.co.uk. We are constantly on the hunt for first order Promotional Vouchers for Wiggle to help you with your money saving. Our experts check dozens of sites for secret codes including NHS discounts, student sites & social media channels saving you time & money!